That's how long Gwen "Gigi" Gray is proud to say her family has not only survived, but thrived in the Stop Six community of Fort Worth, Texas. Because of this, Gigi, a Gospel/Jazz Vocalist, Songwriter and Poet, says her inspiration to write comes from being a listener with a heart for the urban woman. On her life journey as a wife, mother, grandmother and women's diagnostic healthcare professional for more than 27 years, Gigi has helped to share the joys, and bear the pains of life with countless women. She firmly believes she has been gifted by God to translate mere words and sounds into instruments to help promote the physical, emotional and spiritual healing of others. "God has given me the gift of encouragement, and a heart to guide hurting women toward a path to be made whole through Jesus Christ," ~Gigi. In spite of having no formal musical training, and a profound congenital hearing loss, her first formal project, First Fruits: Songs of Encouragement for Women was self-produced in 2005 and continues to be a blessing. A Christian since the age of five years old, Gwen Gigi Gray is currently a member of Cornerstone Baptist Church in Arlington, Texas, where Dr. Wm. Dwight McKissic, Sr. is her pastor. 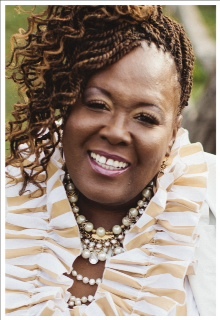 Gigi continues to be a speaker and worship leader, and uses her God-given talent of musicianship to connect with local organizations that provide physical, spiritual and emotional help for women through her group: THE HONEY PROJECT. Gigi also distributes her healing music to women who may never have a "church experience" with the help of Beauty Professionals through her group THE SALON INITIATIVE. Gigi says her musical influences are giants in the industry such as Sarah Vaughan, Etta James, Mahalia Jackson and Albertina Walker. Whether promoting healing of the Body, Soul, or Spirit, Gwen Gigi Gray has a playful style of musical storytelling that's sure to hold your attention! Want to leave a message for Gwen GiGi Gray? We'll post your comments right here! -Gwen is a great friend and musician! I love her music and I always end up with that one song I just can't stop singing...on this album,it's the last song! It was a wonderful musical journey getting to the last song and when we got to it, we hit replay numerous time! Much love to you my friend and thank you for sharing your ministry with SoulProsper Radio. -What a blessing.....Beautiful Soul!...May God Continue to bless with His increase!